I submitted a proposal to the PTO a few weeks ago for Pumpkin Week in the S.T.E.A.M. Lab. Thanks to a few additional pumpkin donations, we decorated about 45 pumpkins in three days. Each class had one 50 minute class period to complete two pumpkins. I’m still recovering from the craziness of it all! I’d planned to do a little more on the math and science components, but because I was at the math conference last week and my pumpkin deadline, it didn’t happen to the extent that I’d hoped for this year. That aside, I’m calling it a success! I’ll make changes for next year. We auctioned off the pumpkins at the school Halloween Howl Friday night. I haven’t seen the final figures, but two of the live auction pumpkins went for $50 each, so it should be a nice ending figure. The rest of the pumpkins were part of a silent auction. I’m really proud of my students. I figured out that tissue paper was the best way to “paint” the pumpkins. 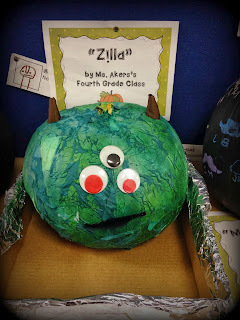 I coated the pumpkin with a glue/water mix using a foam brush and then the students all got to place and flatten a piece of tissue paper on the pumpkin. This way everyone got to take part and the end result was a pumpkin that looked (nearly) perfectly painted. I took pictures of most of the pumpkins. My own two little ones arrived for the carnival at about the same time I got my pumpkins put out, so I missed a few. I let the 4th and 5th grade carve pumpkins with varying degrees of independence. So there you have it! Pumpkin Week in the S.T.E.A.M. Lab. Enjoy! Wonderful idea! Where does the money go that was donated? I like the Minion's and the chickie. The event is run by the PTO. They actually gave me the money raised for my classroom. I'm looking for wireless headphones. Your pumpkins turned out AMAZING...each and every one of them! So fun!